ClearSounds CSC50 boasts up to 50dB amplification, Caller ID with large LCD display, and a flashing ring strobe, plus a full speakerphone with up to +15dB (decibel) amplification. Large numbers and 11 memory dial buttons make dialing a breeze. 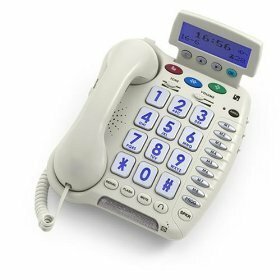 Simply program all your important numbers into the phone for one-touch dialing. The CSC50 phone provides maximum amplification that's customizable to fit your needs. When the "AMPLI" button is pressed, the phone provides up to 40dB amplification gain. For additional amplification, the handset boost button provides another 10dB, for a total of up to 50dB gain. If you have any questions about this product by ClearSounds, contact us by completing and submitting the form below. If you are looking for a specif part number, please include it with your message.